Are you looking for the best alternative Backuptrans iTunes Backup Extractor? If yes, read on as we are going to show you the best substitute for this tool. Sometimes extracting data from iTunes can be a huge challenge for some iPhone users. Fortunately, there are other alternatives to Backuptrans iTunes Backup Extractor tool. Before we look at the alternatives we need to understand what this tool is all about. What Is Backuptrans iTunes Backup Extractor & What Can It Do? 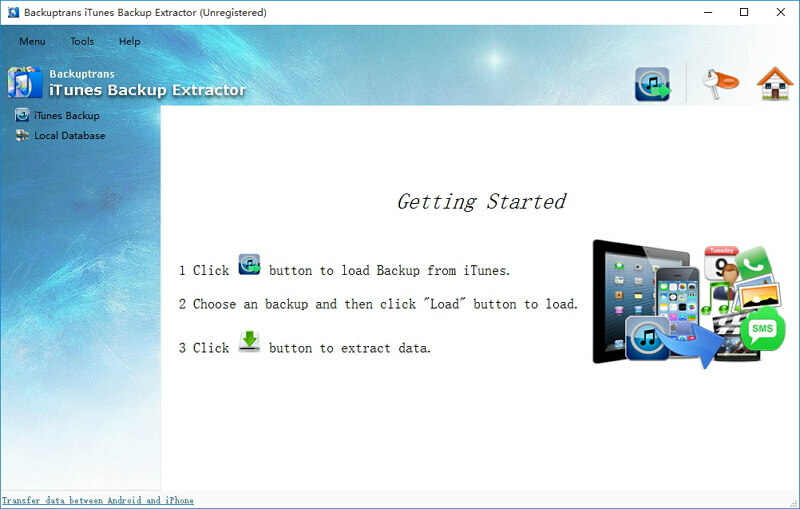 Backuptrans iTunes Backup Extractor is a tool that is designed to enable iPhone, iPad and iPod users to extract their data files from iTunes backup. This tool gives iPhone, iPod, and iPad users the ability to extract their device's data from iTunes to a computer. With this tool, users can also restore and recover all your data from iTunes backup to your device. Users can recover photos, videos, voicemail, camera roll, messages, contacts, call history, voice memo and Safari bookmarks. Extract data from iTunes Backup onto computer. Restore data back to iPhone, iPad or iPod. Retrieve data from encrypted iTunes backup. View all your backed up data files in iTunes backup. Supports iOS 11 and iPhone 8/8 Plus and iPhone X. It supports over 10 types of data, including voicemails. It covers almost all the Windows systems, like Windows NT/2000/XP/2003/Vista/7/8/10. It is not easy to use. The interfaces of Backuptrans are outdated and actually when users click some buttons, they give no response. It doesn’t support 3rd-party social apps for example WhatsApp. All of 10+ types of data it supports are iOS built-in apps, such as messages or contacts. But we all know that 3rd-party social apps matters more for us, now. It doesn’t support iOS 12. From the above discussion, you can see that Backuptrans iTunes Backup Extractor has a couple of advantages and disadvantages. The biggest question is, what is the best alternative to Backuptrans iTunes Backup Extractor? The best substitute for this tool is iMyFone iTransor. iMyFone iTransor is an iOS data backup and restore tool that is loved by many iDevices users. This is a tool that lets you export data from iTunes backup, iCloud backup and from your iOS device. The reason why it is popular is the fact that it is easy to use, convenient, efficient and above all, it supports to export over 18+ types of data from backup files or your device. Besides the feature of data exporting, this tool allows you to selectively back up your device as well as restore all your data to your device whenever you want to recover your data. That's why we say it is a better Backuptrans alternative – it does better than Backuptrans in what Backuptrans can do and it can do what Backuptrans cannot do. Export 18+ types of data from iPhone/iPad, iTunes backups, and iCloud backups. Backup your device without overwriting the previous backup. Separately backup and restore contacts, messages, WeChat or WhatsApp. It is compatible with almost all iOS devices and iOS versions including iPhone X, iPhone 8, and earlier ones. With preview feature, you can view all your data from backup before you choose a specific file to export, then you can get exact what you need. Export from not only iTunes backups, but also iPhone/iPad, and iCloud backups. It has a Free Trial version which allows users to back up device, download iCloud backup, preview data in backups for free. It supports 3rd-party social apps such as WhatsApp and WeChat. It supports the latest iOS 12. It is not a free tool. It supports only Windows 10/8/7. As for some old Windows systems, it might work smoothly on them. If you need to export from your device, the scanning time might be a little long depending on your storage. iMyFone iTransor is not totally the same with Backuptrans, but it is still a good alternative to Backuptrans iTunes Backup Extractor. When compared to Backuptrans iTunes Backup Extractor, iMyFone iTransor offers a lot of benefits and it is affordable. You can use it to export data from iTunes, iCloud and iOS devices, even you use iOS 12. Give the tool a try now!